Xbox Live's annual mega-update will see the release of some highly anticipated features. 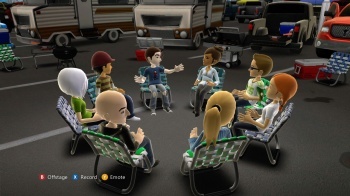 According to Joystiq's sources, the Spring Update of Xbox Live will be series of 6 major software updates from May 19 to May 30, and will feature the release of the Avatar Kinect group chat system announced in January. It will also include a change to the existing PayPal integration, bringing international users the same PayPal support currently enjoyed by US Live subscribers. Avatar Kinect, announced at this year's Consumer Electronics Show, is an application that shows off the Kinect's face and body tracking, allowing your Xbox Live avatar to replicate your movement, facial features, and speech. This can be used to participate in a group chat function where you are represented by your avatar on one of several themed "sets". The option to record and share your chat sessions is also available, and has been advertised as a good way of making video podcasts or personal talk-shows. The update will also add support for a new disk format that will supposedly have 15 percent more space than the current disks. While the Avatar Kinect and extra disk space are nice, it's the international PayPal that seems the most interesting, in light of the recent Sony information-theft debacle. Perhaps this is Microsoft nudging gamers outside of the US, saying, "Psst... you don't have to give us your credit card. Just saying." Or it could just be a nice little update for international users, with no connection to Sony's current problems. Honestly, that's more likely the case, but isn't it fun to try and spot sinister motives where there likely are none? Get me my tin-foil hat!